CORAL’s final issue cover of 2015 features a beautiful and unusual morph of Gonodactylus smithii, the Purple-spotted Mantis Shrimp, found in a cavity in a piece of reef rock. Image by Dr. Roy Caldwell. “Life will find a way,” says Dr. Ian Malcolm from Jurassic Park in Dr. Ronald L. Shimek’s highly anticipated cover story for CORAL November/December. A perpetually fascinating subject for all marine aquarists, the uninvited and unexpected arrival of invasive animals and plants in reef aquariums can often be cause for alarm—but occasionally celebration when a rare coral or valued crustacean turns up as a hitchhiker. 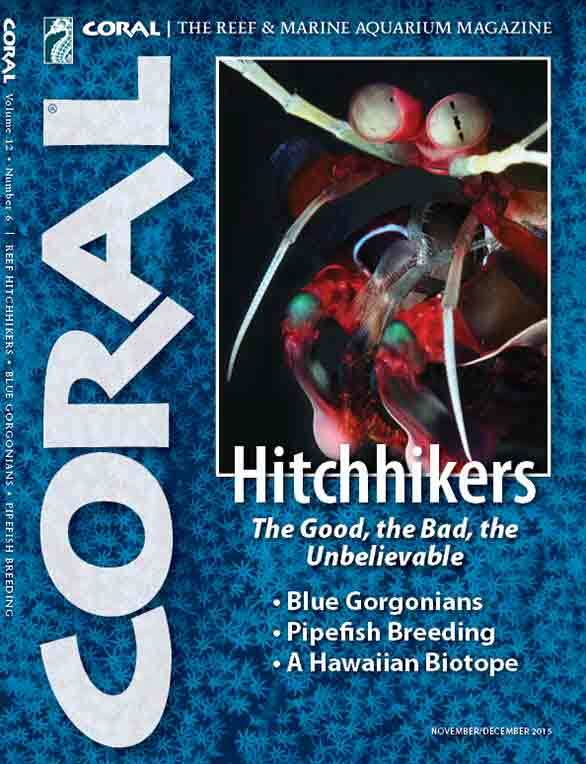 In a section that will be saved for years of future reference, Reef Hitchhikers will gather the writing and images of Dr. Shimek, as well as Robert M. Fenner, Than Thein, Marc Levenson (Melev), Dr. Roy Caldwell and others. • Keeping & Propagating the Beautiful Blue Gorgonians: Daniel Knop reveals his secrets for success with Guaiagorgia anas.